Mainstream Isn't So Bad...Is It? : Tumbele! There really isn't any better time to be a musical collector than the present. There are just so many great smaller labels putting out some phenomenal stuff, both new and old. An excellent example of the latter is Soundway Records. I wrote about them earlier this year, during the summer, when talking about their excellent Latin release, Panama! 2: Latin Sounds, Cumbia Tropical and Calypso Funk on the Isthmus 1967-77. Go into your local music store and I'm guessing you'd be hard pressed to find any Panamanian music (unless of course you live in Panama and you're reading this), which makes it all that much more necessary for a small label like Soundway to do the great work they do to make it available for all of us who can't fly around the world digging for records. 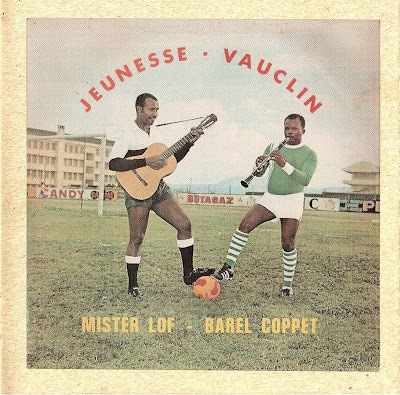 Well, last month, they've dug even deeper into Latin America, and as if Panamanian music wasn't getting nitty gritty enough, they've zeroed in on an even smaller target: Guadeloupe and Martinique. Heck, ask the next ten people you talk to if they can tell you where those two countries are and I'm guessing 1 or 2 of them might be on target (for your info, they're two islands which are part of the Lesser Antilles, the eastern Caribbean island chain that also includes Dominica, St. Lucia, and Marie-Galante). The two islands are overseas departments of France (i.e. I guess they're rough equivalent of Alaska and Hawaii? ), and have a lengthy history of outside influence of all sorts, not just French. The musical output of these two islands far exceeds what one would expect from their size, and it's documented on Soundways' latest release: Tumbélé! 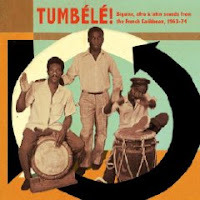 Biguine, Afro & Latin Sounds - French Caribbean 1963-73. The album's twenty tracks (all previously unavailable outside of the islands and their near neighbors) attempt to represent this varied yet distinct musical identity which draws upon French, African, and Latin influences. Accompanying the music are liner notes that detail the development of the islands' sound, as well as song by song notes explaining their origins and how they fit into the islands' musical histories. Try out two of the CDs tracks below. Visit the Soundway Records website.